Imagine that you do everything you can to avoid overdrafting your bank account, only to find that your bank has gone ahead and pushed you into the red — and that it doesn’t really care. It might be hard to imagine, but that’s exactly what happened to Consumerist reader Ed after he made a recent deposit to his TD Bank account. Earlier this month, Ed made a deposit on his relatively new TD Bank account through an ATM at the bank. The deposit, for $543.71, was simply a regular paycheck from Ed’s job. In the past, when Ed made a similar deposit, the bank would make $100 available and hold the remainder until the check cleared. That’s what Ed was expecting this time, but it didn’t happen. Instead, the bank created two holds — one for $443.71, and another for $343.71 — totaling $787.42. 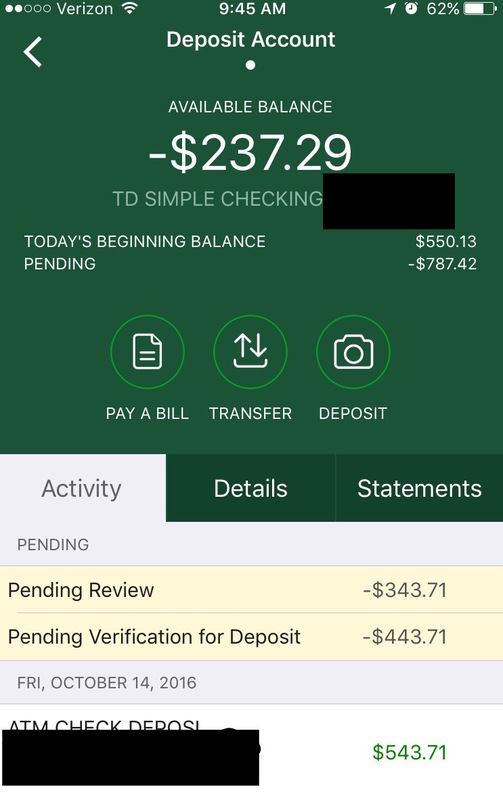 That was more than Ted had in his account to begin with, meaning TD Bank had somehow pushed his balance into the negative by $237.29. A look at Ed’s account suggests that the bank may simply have committed an error, creating two holds on his account. The initial hold shows an amount of $443.71, which is $100 less the deposit, meaning that $100 would have been made available to Ed after the deposit. However, a second line labeled “Pending Review” shows another hold for $343.71, which is $100 less the initial hold, which would have theoretically left $100 available to Ed. This suggests that the bank may have simply held the funds twice in error. However, the bank did not admit this to Ed or to Consumerist when reached for comment. What Do The Rules Say? Instead, TD Bank tells Consumerist that it is their policy to sometimes hold more than the deposited amount or create two holds on certain accounts. Thankfully, Ed tells Consumerist, he hadn’t enrolled in an overdraft program with the bank that would have charged fees for being overdrawn. Instead, he has the account set up to simply decline instead of overdrafting. According to the rep, the money subject to a second hold is available to the customer during the hold period, and the account information appears normally after one business day. Ed, however, says that he was unable to access the funds, and the hold did not resolve itself until Tuesday, Oct. 18, three days after the Friday evening deposit. According to the Consumer Financial Protection Bureau, there is no federal regulation dictating the amount of funds a bank can hold after depositing a check. Each bank or credit union can create their own rules as to when or how much they will let you access of your money after a deposit. These rules can vary within the same bank depending on the type of account. While we couldn’t find mention of the bank’s policy for two holds on accounts, the terms for TD Bank’s Simple Checking Account [PDF] and Personal Deposit Account Agreement [PDF] come with several conditions. For example, TD Bank’s Simple Checking Account — the account Ed has at the bank — stipulates that non-cash deposits made at any TD Bank Store or ATM will result in the first $100 being available immediately and the remainder available the next business day. According to the bank’s Personal Account Deposit Agreement, longer delays may apply to certain new accounts and large deposit. • Cash deposits and the first $100 of a check deposit made at a TD Bank ATM will be available to you on the first Business Day after the day of your deposit. • Cash deposits made at an ATM the Bank does not own or operate will be available no later than the fifth Business Day after the day of your deposit. • Check deposits made at an ATM the Bank does not own or operate will be available no later than the seventh Business Day after the day of your deposit. Despite these wide-array of stipulations for the account and the Deposit Agreement, nothing suggests that the bank will hold funds in excess of a deposit amount creating a negative balance.